The Cat in the Hat movie script is based on the Dr. Seuss book of the same name. The story of the Cat in the Hat holds a place on the elite top ten listing of all-time best-selling hardcover children's books. The Dr. Seuss classic has been a favorite story of children and adults alike since the book was first published in 1957, and television viewers have been able to periodically enjoy the cartoon version of the story since 1971. In 2003, the story of the Cat in the Hat was brought to life on the big screen in a live action movie version. The story of the much-loved children's book is reflected in the movie, with a number of additional storylines and characters. The film features all of the characters from the book, as well as new personalities created just for the film version. The story starts out with the Walden Siblings, Conrad and Sally, spending a boring rainy day at home. Sally's character is in the book, but Conrad's is one of the additions to the movie version of the story. The brother and sister are hanging out with their pet goldfish when the title character comes into their home -- and their imaginations -- bringing fun, mischief and mayhem to the day. The children's mom is stressing out over preparations for an important business event at the house that evening. She has prepared the living room for company, including her boss (who is a true germ-o-phobe!) and has ordered Conrad and Sally to stay out of the room to keep it clean and in good order. That all goes out the window when the cat arrives. What starts out as fun and games quickly gets out of control, and the children have to step up and be the responsible family members their mom needs them to be before it's too late. Presented by Universal Pictures, DreamWorks Pictures, and Imagine Entertainment presentation, the Cat in the Hat movie script is brought to life by the award winning production and directorial team of Brian Grazer and Bo Welch, plus a star-studded cast. If you'd like to learn more about the movie's content, you can find a transcript of the Cat in the Hat movie script online at Script-O-Rama. While not an official script copy, the individual who produced the online script did so as a result of watching the film numerous times while transcribing the text. You can also see the movie for yourself. The DVD is available for rent at video stores, from supermarket video kiosks, and from online video delivery services everywhere. 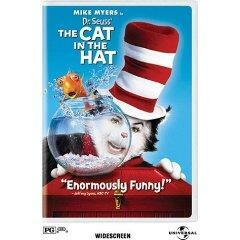 If your local library offers movie rentals, you may find a copy of the film version of Cat in the Hat there. You can also purchase your own copy from your favorite video retailer or from Amazon.com.